I’ve always been a touch shameless when it comes to adapting inflections and expressions from other cultures. I take what I like and use it without thought to the language police that may soon come knocking at my door for blatant misuse of material that does not, rightfully, belong to me. Sometimes, I don’t even know where a certain pronunciation comes from…I just like the way it rolls off my tongue, and so, just like that, it is mine. For example: I love the way Australians say “eski” instead of “cooler” — so much sassier. I also love the way both Australians and British say fillet as “fil-let” instead of “fih-ley“, so I say it that way too…let’s celebrate the “T” shall we? In the same line, I always pronounce the “t” in often (oft-ten) — in fact, I say the word “often” quite often because I just can’t get enough of the way it sounds. Same with the “l” in salmon. I say “sal-mon”, not “sa-mon” no matter how many time my mother cracks a whip at me. I very secretly love the way the British say “maths” instead of “math”…although admittedly, I haven’t mustered the guts to use it…yet. Anyway, this is all to say that, and this is just my humble opinion, in life there are things you can’t change and things you can. The secret is knowing the difference. Also, almost everything sounds much more sophisticated in French. – Place a small pat of butter in a ramekin or any oven proof dish that will hold 2 eggs. Rub the butter to coat the inside of the ramekin. – Place the bacon strips on the bottom and sides of the ramekin. Place the cream cheese on the bottom of the ramekin, on top of the bacon, and spread to cover the whole bottom part. Gently pour in your 2 eggs (or 1 egg and 1 yolk). Pour your cream on top of the egg white, leaving the yolks exposed. Top with some sea salt and freshly cracked black pepper. – Place the ramekin in a pan and pour into the pan some hot water until the water comes up to about halfway the sides of the ramekin. Place in a pre-heated 350F oven and baked for about 15 minutes (more or less, depending on how you like your eggs cooked). Serves one. Whether you call this en cocotte or simply baked eggs, does not ultimately detract from its deliciousness. It is a warm, creamy, luscious blanket of comfort. Whether to fortify you for a busy day, or reward yourself on a bright Sunday morning for a hard week of work, it is perfection in its simplicity. Which is really what bacon and eggs is, in my book at least…that stalwart pair you will keep coming back to no matter what bizarre diets or mystifying food trends may come. A piece of warm toast to dunk in and make a mess with, and you are set for the mother of all therapy sessions. So while we are cozily installed amidst our Sunday morning breakfasts, let’s take a look around, our rooms and our lives, and see what we could change towards making us happier people. It could be moving the sofa to the other end of the room, or changing the way we see the world, or simply changing the way we say the word “often”. Make sure to take a good look because there may be things lying around (our rooms or our lives) that we always thought were unchangeable…but actually are the very things ripest for change. Ah so, "maths" originated from the Brits? hehe, Ive been hearing it a lot and thought of using it but i haven't found the timing yet. This post cracked me up. Love it! 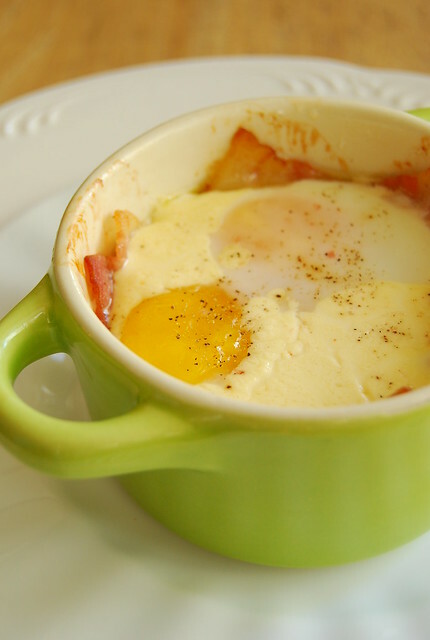 My favorite egg dish of all time is something similar, Ina Garten's baked eggs. I add half a strip of bacon halfway through as Chrissy Teigen (a Sports Illustrated Swimsuit model with a food blog) suggested. Delicious!! Hi Kat! I will check out that recipe! Yes, yes, I agree. Everything sounds better in French! But that's just me 🙂 When it comes to grammar, I like to follow British conventions. Sometimes. Hehehe. Eggs en cocotte? Mais oui! Hi this looks fantastic – I'm definitely going to give it a go when I return to the UK. Hi Midge! You are a voice actor! How exciting! I'm a big fan of baked eggs. Looks great! yum sounds great! can't wait to make it! Very good idea!! !i like it..